If you're feeling the need to create a little sustainability in your life, you're not alone! DIY projects like this one, that help us reduce the amount of waste we create, are inspiring on so many levels. 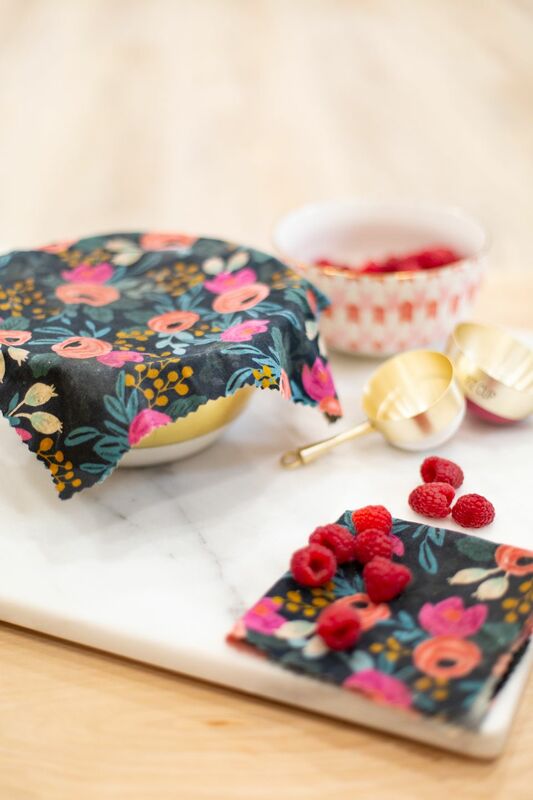 These reusable food wraps will eliminate your need for one-time-use food wraps for the leftovers in your kitchen, and you can make them for just pennies each! A few simple supplies can help you create wraps in every shape and size so you'll always have some on-hand to keep your food fresh and safe. As you're gathering your materials, keep in mind the quantities you'd like to have on-hand. 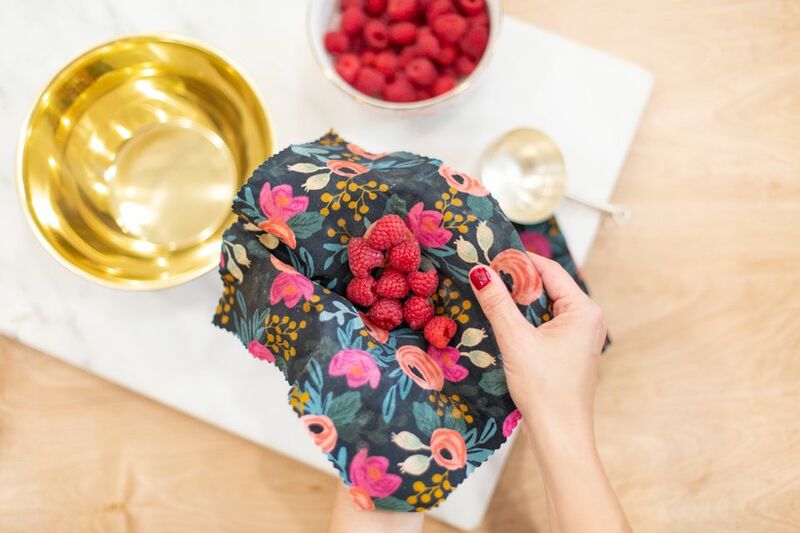 Making one wrap takes just one or two teaspoons of ingredients, so if you order the materials in bulk, you'll have plenty on-hand to make a good number of reusable food wraps. Also, as you're selecting your fabric, keep in mind that a thin, flexible cotton works best. If you like, you can choose organic fabric, as it will be in contact with your food. Begin by washing and drying your fabric thoroughly, to remove any dirt, debris, or chemicals that may have been involved in the process of creating it. Next, cut your fabric to the size that you would like your reusable food wraps to be. This will probably be determined by the size of your baking sheets; you'll need to lay the fabric flat on the baking sheet to prepare the wraps, so don't cut the fabric any larger than your baking sheets. It's also helpful to have some smaller, square wraps for smaller dishes. Cut the fabric with pinking shears to avoid fraying. Cut parchment paper to the size of your baking sheets and cover them with the parchment. Place the fabric onto the parchment paper on each baking sheet. On each sheet of fabric, sprinkle your ingredients. Evenly spread 1/2 teaspoon of jojoba oil, 1 teaspoon of pine rosin, and 2 teaspoons of beeswax pellets. Try to cover the fabric as evenly as possible with each ingredient. Place the baking sheets into the oven. Heat them for 10 minutes, or until all of the ingredients have melted completely. Use a clean paintbrush to evenly spread the ingredients around, covering the fabric completely. Place them back in the oven for 1-2 more minutes to ensure even coverage. Remove the baking sheets from the oven. After allowing the wraps to cool for a moment, lift them off of the baking sheets and drape them over something to allow them to set. You can use bowls, cups, hangers, or anything that will work. Use the reusable wraps to cover your food! You can cover dishes, leftovers, or just enfold them in a wrap and clip it closed. To clean, rinse the wraps with cool water, as hot water will melt the wax.